With members from Russia, Malaysia, and the United States, Tangonero is a San Francisco based ensemble dedicated to preserving the tradition of Argentine Tango. From the folk styling of Roberto Grela to the jazz infused grandeur of Astor Piazzolla, their arrangements cover the broad scope of tango history. Overflowing with intense passion, lust and sorrow, their performance captures the fire of the dance and the essence of a culture. Tangonero was awarded the CMC Shenson Award for their original stage production Malena, in collaboration with Argentine vocalist Claudio Ortega and dancers Count Glover and Chelsea Eng. They have performed at numerous festivals including Portland ValenTango, San Francisco Tango Xchange, Boston Tango Festival, Cotati Accordion Festival, and have shared the stage with Grammy Artists Jeremy Cohen and Pablo Aslan. In 2009 they released their first album, La Yumba, and their most recent album Mala Junta was released in the Fall of 2015. They continue to perform throughout the United States in both dance and concert halls. 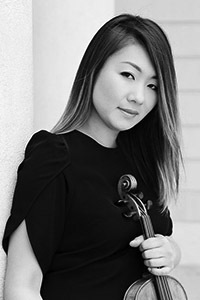 Yuri Kye is a violinist and violist who is an active performer and educator. She is a member of Sarasota Opera in Florida, and performs regularly with orchestras in the Bay Area and beyond, including Monterey Symphony, Merced Symphony, Opera San Jose, Berkeley Symphony, and more. A dedicated chamber musician, Yuri is a founding member of the San Francisco-based Alden Trio and the lead violinist of Elevate Ensemble, a group focused on obscure and contemporary chamber music repertoire with unconventional instrumentation. 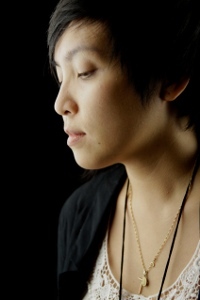 An active session musician and crossover artist, some of her recent studio credits include albums by Matt Nathanson, Jennifer Hudson, Natalie Dawn as well as the soundtrack to the film “Torch” by Christopher Coppola, and she has collaborated with the likes of Deltron 3030, Third Eye Blind, Ten Tenors, and The Album Leaf. Born in Malaysia, Celeste began her musical journey at the age of four. The music path unfolded naturally for Celeste as she continued pursuing piano performance in the US, earning her Doctor of Musical Arts degree from the Conservatory of Music and Dance at the University of Missouri-Kansas City. Winner of several piano competitions, she has been featured as the soloist accompanied by collegiate and professional orchestras. As a trained ballet dancer of 16 years, Celeste immediately recognized her love at first sight for both the music and dance of Argentine tango. Upon discovering the Bay area tango community, she joined L.O.F.T (La Orquesta Fusion Tango) ensemble to cultivate her new found passion, and was subsequently led to Tangonero. Celeste receives coaching from highly esteemed tango musicians, Pablo Estigarribia, Emilio Solla, and Hector Del Curto to refine her skills. 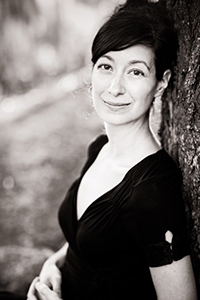 Aside from her devotion to music education, Celeste is enthused about her current and future endeavors in tango music and dance, which she affectionately conveys in her immersive performance. Born and raised in Moscow, Russia, Alex Roitman began playing the piano when he was 7 years old. He has studied accordion with Peter DiBono, San Francisco's premier accordionist. During his accordion years, he enjoyed playing Klezmer, Italian, French musette, and Russian music. His playing has been featured in "Pure Piaf", a musical about the life of Edith Piaf. 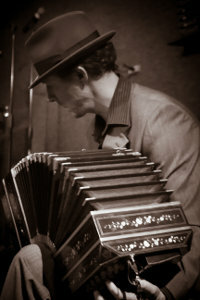 Alex's passion for Argentine Tango led him to study the bandoneon, first on his own, then with Ville Hiltula, and finally with Hector Del Curto. As a bandoneonist, Alex plays locally in San Francisco where he leads his band Tangonero. He is also a member of a Stowe Tango Music Festival tango orchestra, and a bronze medalist in the 2018 Che Bandoneon International Competition. Alex shared the stage with legendary tango musicians as Victor Lavallen, Horacio Cabarcos, Pablo Estigarribia, Jose Colangelo, Pablo Agri, Nicolas Ledesma, Humberto Ridolfi, Julio Pane, as well as the members of Hector Del Curto's quintet. In addition to his bandoneon work, Alex has composed several tango pieces and continues to work on transcribing and arranging great tango music of the past. 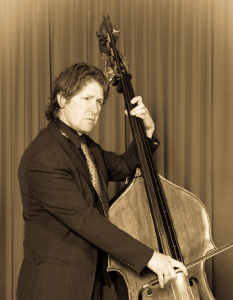 Originally from Alaska, bassist Richard Duke began playing electric bass as a teenager and took up the double bass in college. With degrees from University of California Santa Cruz (BA) and Northwestern University (MM) Richard performs throughout the Bay Area with numerous groups presenting Opera, Symphonic Orchestra, Ballet, Tango, Salsa, Jazz, Broadway shows, Cabaret and Rock and Roll. Richard is a member of the Monterey Symphony, Napa Valley Symphony and Sacramento Philharmonic, as well as occasional substitute player with San Francisco Ballet, San Francisco Opera, Philharmonia Baroque, and numerous Broadway productions. Show credits include Color Purple, Wicked, Spamalot, Legally Blonde, Young Frankenstein, Beauty and the Beast, West Side Story, Chicago, Light in the Piazza, Edward Scissorhands. 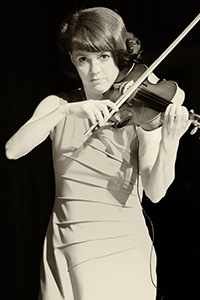 Violinist Michèle Walther performs in a variety of music styles from jazz and classical to the avant-garde and world music. She has toured the East coast with Ian Anderson/Jethro Tull, performing in venues such as the Rose Theatre in NYC. Michèle has performed with Joe Lovano, Gloria Estefan, Oscar Stagnaro (Paquito D’Rivera), Pablo Ablanedo Septet (jazz, latin; label fresh sound/new talent), Vardan Ovsepian Chamber Ensemble (jazz; label fresh sound/new talent), The Boston String Quartet (CD Spectrum), Mark Feldman, Steve Gadd, and more. She is a founding member of LaMuseMent (CD orange heart, label altrisuoni.) She has also performed Argentine tango and folk with Los Changos and Los Gatos Azules, with whom she won first prize in Boston’s Battle of the Tango Bands. Recording credits include The Boston String Quartet, Jamey Haddad, and Oscar Stagnaro. In the Bay Area, Michèle can be heard with the George Cole Band and the Resonance Jazz Octet. Ms. Walther earned her M.M. at the Conservatory of Music in Basel, Switzerland, and later graduated from the Berklee College of Music in Boston, majoring in jazz performance. Amy Zanrosso decided she wanted to be a pianist at the age of fifteen after she realized that she just couldn’t live without the constant presence of Beethoven and Brahms in her life. They didn’t have much say in the matter. So with an undergrad degree tucked under her arm, Amy moved to Italy for a few years of study and then returned to Canada to complete a Master’s Degree at McGill University in Montreal. She has happily collaborated with a wide range of fantastic musicians running the gamut from German cabaret to Tango Nuevo and back, always under the watchful eyes of Ludwig and Johannes. In 2014, Amy moved to the Bay Area and is steadily realizing her plan of learning and performing all the piano trio/quartet/quintet literature in existence. When not practicing Brahms or Beethoven, Amy can be found coaching chamber music at the San Francisco Conservatory of Music or riding her bike to rehearsals. Pianist I-Yun Chung is an in-demand performer, composer, arranger, accompanist, and teacher in the San Francisco Bay Area. Born in Hsin-Chu Taiwan, I-Yun began her formal musical studies at the age of six. Her exceptional talent as a classical pianist was apparent from an early age, and she was awarded first place in the Hsin-Chu Piano Competition from 1992-1998. In addition to her heavy-weight classical chops, I-Yun is well-versed in a multitude of different musical genres: jazz, rock, pop, tango. In the spring of 2008, I-Yun founded the group "Aires de Argentina", an ensemble that specializes in its own brand of tango fusion. 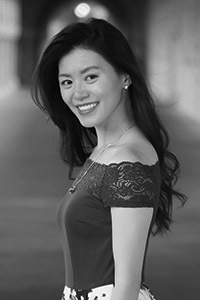 I-Yun holds a degree in classical piano performance from the National Taiwan University of Art and bachelor's degree in Film Scoring from the Berklee College of Music in Boston. 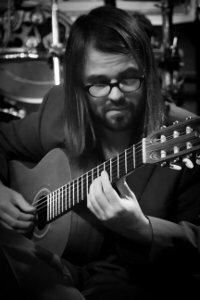 Zac Selissen is a guitarist and arranger whose performance of the guitar has earned him mastery of a wide range of music – from rock to jazz, bossa, and bluegrass, from classical to tango and flamenco. In addition to performing with Tangonero, he spends his time arranging for his classical guitar duo, Duo Symphonious, the University of St. Thomas Guitar Ensemble, and Out of the Chamber Arts Collective. He is currently on the guitar faculty of Community Music Center in San Francisco and New Mozart School of Music in Palo Alto. As a member of Duo Symphonious, he was awarded the CMC Shenson Award for their original adaptation of Tchaikovsky’s Nutcracker Ballet, and was awarded the Certificate of Honor by Mayor Gavin Newsom for their performance at San Francisco City Hall. He earned his Masters of Music degree in Guitar Performance from the San Francisco Conservatory of Music under the instruction of Marc Teicholz and has received coaching from Sergio Assad, Meng Su, Yameng Wang, Peter and Zoltan Katona, David Tanenbaum, and Lawrence Ferrara.